If you can only remember one date in all the fascinating history of Britain. Remember 1066! A reminder: Against my better judgment and through nearly faultless research and painstaking scribbles that led my faithful readers through thousands of years of British history, I bring you to the year that everything changed. Yes, of course, in the relentless march of time, whether we’re speaking of changes in climate, or the miraculous splitting of continents, or the decline and fall of bellbottom trousers, changes occur. But some changes are more immediate and dramatic than others. 1066 was both. In the case of Britain, I’ve taken you from Pre-Roman times, to Roman times, the exit of Romans, the rise of the Vikings to the fall of the Vikings. But, those were petty and temporary changes in Britain compared to what happened next. For those unfortunates who have not read my previous scintillating prose portrayals of the formation of Britain, I’ve listed the links below. 5 January – Edward the Confessor, the King of England dies with no heirs and promises William the Duke of Normandy that he will be king. Harold Godwinson another claimant to the throne, but without blood ties to Edward, swears to abide by the King’s decision. But on his deathbed, the King apparently changed his mind and told Harold that he would be King. There are lots of ends and outs here, but I'm giving you the bare framework. So what was the connection between Edward the Confessor (King of England) and William the Duke of Normandy? They shared a bloodline. 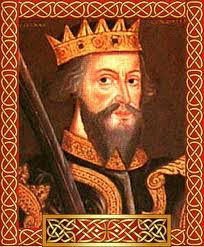 Edward’s grandfather was William the Conqueror’s great grandfather. 18 September – Norwegian King Harald Hadrada (yet another claimant to the throne of England) invades England from Norway. 20 September – King Hadrada defeats the northern English earls and King Harold’s brother, Tosig Godwinson joins the Norwegian King’s victorious army. King Harold had exiled his brother previously, so Tosig had a bone to pick. But he picked the wrong bone. Harold II rides his army north to meet the invaders. 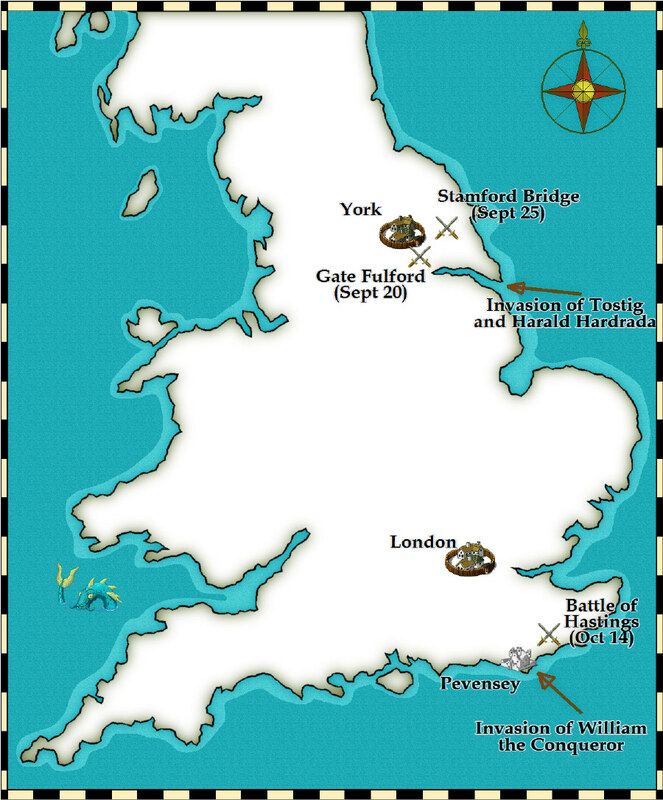 25 September – Harold II wins the battle of Stamford Bridge. Both Tosig and the Norwegian King are killed during the battle. Hooray! Hooray! But, wait a second and not so fast, King Harold! 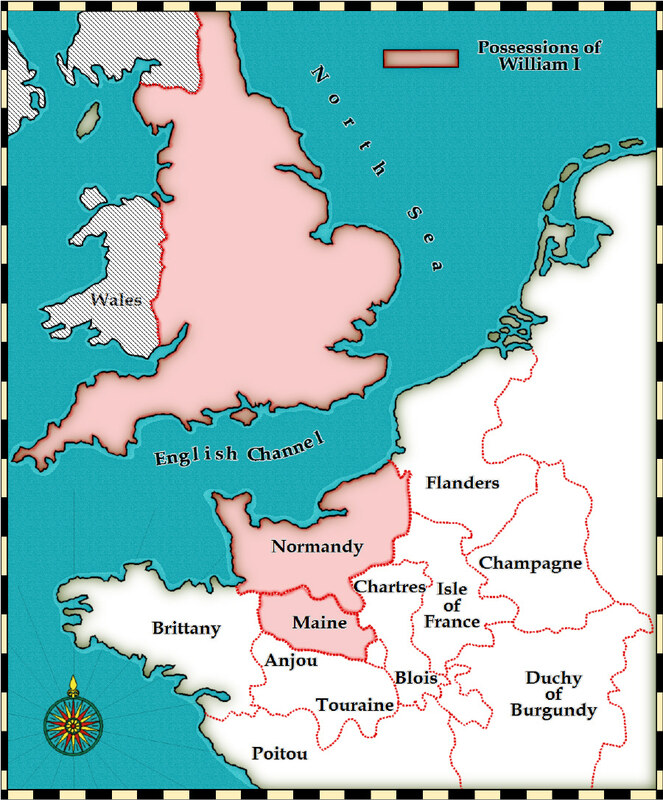 26 September – William, Duke of Normandy has a blood tie claim to the throne of England. He and his army set sail for the English coast. 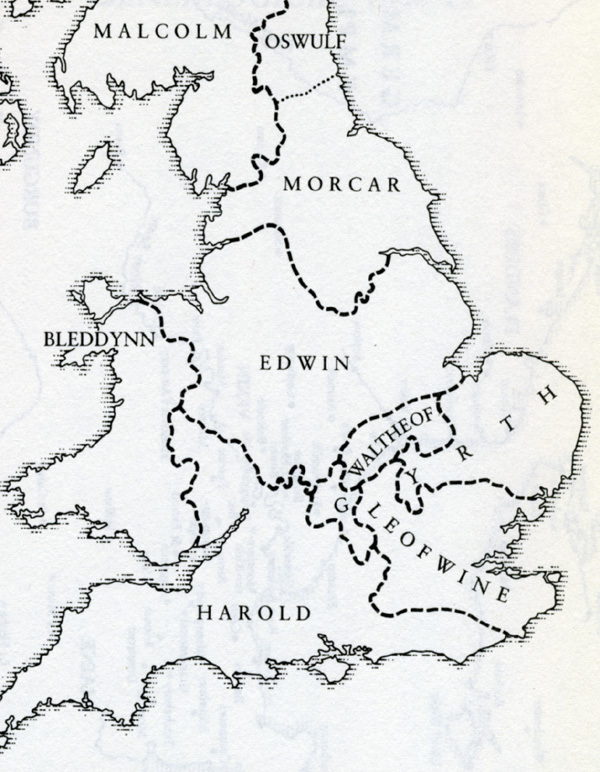 Edward the Confessor told me I would be king and Harold swore an oath to support my claim. Went back on his oath? Them’s fightin’ words! Harold, no doubt sensing a problem as big and nasty as a boil on the part of the body that meets the saddle, hurries his army south. On William’s part there had been many fits and starts before the voyage began. Troubles were many, including winds and weather and desertions. The number of vessels in the fleet is estimated at between 776 and 1000. 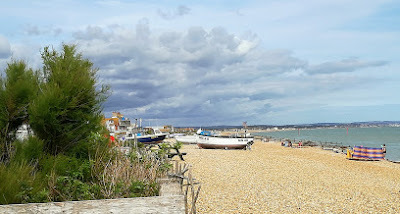 28 September 1066 - William’s army lands at Pevensey Bay, about 50 miles south-southeast of London. 14 October - The Battle of Hastings, which evidently took place nearer the town of Battle, rather than Hastings, will change the direction of Anglo-Saxon England, as well as English life. The Norman army is victorious. 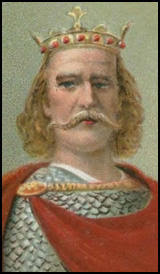 English King Harold II is killed, reportedly by an arrow in the eye. However, an arrow through the eye was the customary death for someone who broke his oath, so the report may have been changed to conform with custom. Some historians believe he was clubbed to death. No one knows where he is buried. Ok, you’ve got the date and the name of the battle, but let’s examine what the battle was like. First some interesting facts from Britain Magazine. If you’re an anglophile, as I am, can’t recommend this magazine highly enough! The first man killed in the battle was Taillefer, William’s jester. Here’s how it happened. Taillefer ran out in front and taunted the English by singing the Chanson de Roland and juggling with his sword. An English soldier ran out to confront him and was slain. Taillefer then charged the English line and was overwhelmed. Guess the jester didn’t get the last laugh. It wasn’t a fair fight. Really? What commander wants a fair fight? 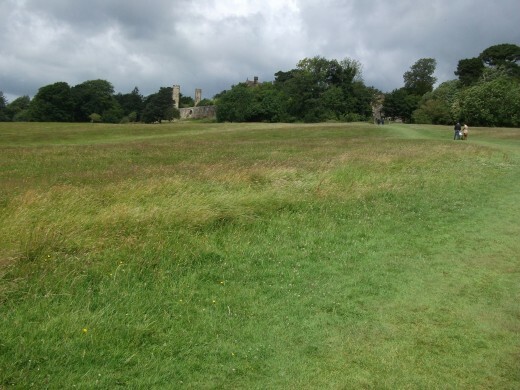 The English army was a few thousand men short, numbering about 5,000, mostly on foot, with a few archers. The larger French army, about 15,000 men. was supported by archers and about one fourth of the army was cavalry. In truth, the sizes of the armys are estimates. For Harold, 5000 to 7000 troops. For William, 10,000 to 15,000 troops. 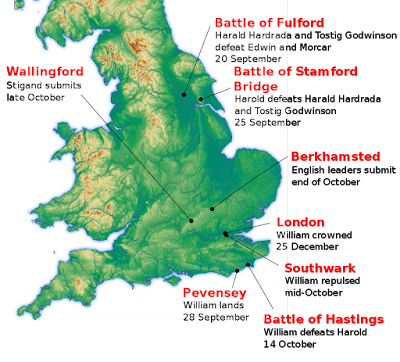 The layout of the Battle of Hastings, with the English Army in Red. Still the English put up a good fight and Harold II had a great plan. First, he took the high ground and a defensive position, and set up a shield wall. Harold warned his troops, who were both outnumbered and weary from the long march south, to simply hold the line and not to waiver. He expected a northern army to arrive with fresh troops. 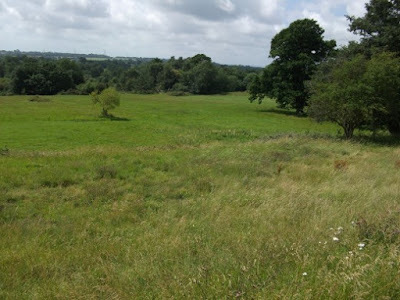 The English view of the battlefield looking down the hill. The battle began about 9 a.m. The Normans attacked with cavalry and were repulsed. Several more attacks met with the same result. About 1 p.m., while attacking the English right flank (Norman left flank) the Normans took heavy losses and apparently instead of withdrawing in an orderly fashion, they ran. Thinking the Normans were close to defeat, the English right flank pursued rapidly. There was also a rumor that William had been killed. Not so! William mounted a second house and rode down his line with his helmet shield raised to prove he was alive. Seeing the English racing after his fleeing troops, William sent his cavalry to cut the English off, and trapped them in the open. With the English right flank decimated, William took advantage, attacking all across the English front. In the end, he did something very clever. With few arrows left, he told his archers to wait until the Norman troops were almost at the English line, then to fire high in the air. The English shield line could not use shields to defend against both on-coming foot soldiers and arrows raining down from on high. In the end, the Saxon army was crushed. By dusk the battle was over. The northern army Harold counted on never arrived. The days of Anglo-Saxon hegemony were over. England belonged to the Normans. On Christmas Day 1066, William was crowned King of England in the newly built Westminster Abby, London. Next we’ll look at life under the Normans and the new direction of English history.